The company, celebrating its centenary this year, expects the strongest momentum to come from Asia and sees better results coming from the US and Europe with the US expecting noticeable GDP growth and Europe, in line with forecasts of market experts, pulling out of recession. Meanwhile, the company has set up new production sites in Asia, expanded production in some existing ones there and in the US and is building a new plant in the US, the investments for all of which will strengthen Wacker’ position as the world’s leading manufacturer of polymers for dispersions and gumbase. It also took over a production site in Halle, Germany, for manufacturing therapeutic proteins. Giving a global overview to the world’s press in Munich, Wacker president and CEO Dr Rudolf Staudigl said: “Business in January and February picked up noticeably. At all our divisions, we are experiencing robust demand and, in some cases, somewhat better prices.” He expects Q1 sales to surpass those of Q1 2013. During 2014, the company expects not only its chemical divisions but also its polysilicon and semiconductor-wafer operations will very likely see sales growth, depending on semiconductor demand picking up in line with market experts’ projections. With the solar energy trend remaining highly positive, new markets are opening up, particularly in Asia and other emerging regions with further growth potential areas including China, the US, Japan, India and South Africa. Wacker’s polysilicon is used to manufacture highly efficient solar modules. Wacker generated sales of almost 4.5 billion euros ($6.21 billion) in 2013, down over 3 per cent compared with the previous year in the aftermath of lower year-on-year prices especially for solar silicon and semiconductor wafers. EBITDA – earnings before interest, taxes, depreciation and amortisation – remained below the prior-year figure, amounting to some 680 million euros – close to 15 per cent less than a year earlier. The corresponding EBITDA margin was 15 per cent. Lower pricing, especially for polysilicon, cost the company over 360 million euros in earnings. Polysilicon prices did remain more or less stable from the start of 2013 but, on average, they were a third lower than in 2012. Exchange rate effects resulting from the strong euro also reduced earnings by around 10 million euros. Wacker lowered costs by some 225 million euros by implementing various measures at its business divisions and corporate departments. The company also benefited from higher production output. Non-recurring effects, on balance also had a positive EBITDA impact, some 90 million euros. Wacker ended 2013 with group net income of 6 million euros, almost 110 million euros less than a year earlier. Wacker’s chemical divisions in aggregate maintained the high prior-year sales level and increased earnings. The silicones division expanded its business further. Silicones volumes were especially strong for personal-care products, industrial applications and medical technology. As a result sales climbed to 1.67 billion euros, up 2 per cent compared with the previous year. 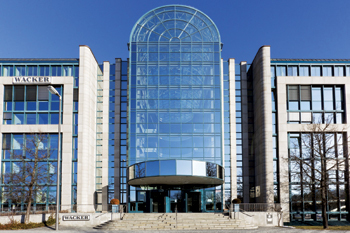 At Wacker Polymers, sales decreased slightly to around 980 million euros in 2013. The drop was due to slower dispersions business, especially in the packaging industry. Selling prices were lower and there were negative exchange-rate effects. In the semiconductor business sales declined substantially due to lagging customer demand and lower wafer prices. For 300 mm wafers, volumes edged up slightly while volumes for 200 mm wafers stayed at the prior-year level. Smaller diameters saw volumes drop well below the 2012 level. For the full year, Siltronic generated sales of 743 million euros – over 14 per cent down on the year-earlier figure. The polysilicon division had a difficult year with the consolidation process in the solar industry continuing, resulting in overcapacity and price pressure. Additionally, market participants were unsettled by the anti-dumping dispute between the EU and China which was not resolved until the end of July. In total the company supplied some 49,000 tonnes of polysilicon last year, almost 30 per cent more than in the previous year and expanded its market share. But annual prices were about a third lower on average than in 2012. Consequently sales decreased by almost 19 per cent to 924 million euros. Wacker invested 500 million euros in 2013 half the amount of the previous year. Its investing activities remained centered on the construction of its new polysilicon site at Charleston in the US state of Tennessee. About 250 million euros flowed into this project in 2013. The company intends ramping up the Charleston facilities in H2, 2015. Wacker has opened a new production facility for vinyl acetate-ethylene copolymer dispersions in Ulsan, South Korea with an annual capacity of 40,000 tonnes. At its polymer site in Nanjing its existing production plants for dispersions were enlarged. A new reactor with an annual output of 60,000 tonnes came on stream. Nanjing also saw the completion of a new plant for polyvinyl acetate solid resins with annual capacity of 20,000 tonnes. In the US, the polymers site at Calvert City was expanded, with the addition of 30,000 tonnes of annual dispersions capacity. These investment projects will strengthen Wacker’ position as the world’s leading manufacturer of polymers for dispersions and gumbase.